Before buying a Dual SIM phone, it is advisable to know the characteristics of each model for what SIM management is concerned, so you can choose the phone that best of all answers to your needs. There are essentially two technologies: DSFA (more complex, more expensive, allowing the most complete management of SIM cards) and DSDS (more economical and simple, with limitations). Also called DSDW (Dual SIM Dual Working), these terminals contain the most complete Dual SIM technology. The complex projecting and high production costs due to double components makes this technology the election for high quality and COMPLETE Dual SIM phones. Internally, a DSFA device has two transceivers, two processors and two antennae (practically two cell phones in one case). This makes both SIM cards always available in reception and conversation; both SIM can ALWAYS work contemporarily. 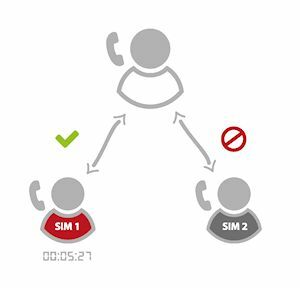 If we are having a phone call on one SIM, an incoming call on the other SIM will still be possible so it’s up to us if we want to answer holding the first call and easily switch from one to the other or even holding the call and making a new call with the other SIM card thus maintaining an active conversation on both lines. These operations are possible only with this special technology. If you really need a complete Dual SIM phone that always has two active SIM cards, if you always want to be available on both numbers, if you instantly want to know who’s calling your other number even if you’re calling with the first one, you need a DSFA (Dual SIM Full Active) terminal. Also called DSSW (Dual SIM Single Working), this is the simplest and most economical technology, that is why it is held by most terminals on the market. In this type of device you will find one transceiver, processor and antenna. The processor is advanced, made to manage two SIM cards contemporarily. 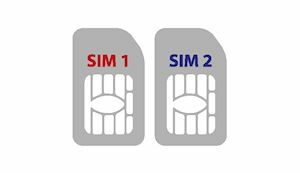 This technology doesn’t allow having two always active SIM cards during conversation; only in the standby state, both are able to receive a phone call but as soon as that happens, the other one is turned off. 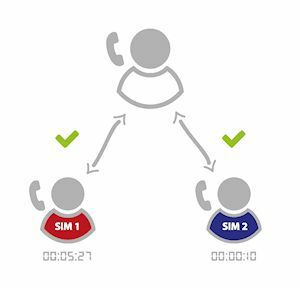 Moreover, in the standby state, you can rapidly choose to call with the one or the other number by pressing the correspondent call key but again, as soon as the call is sent the other SIM card is turned off; whoever calls it will find a turned off terminal.